We have a secret: Up until this article, we’ve only shared this with a few close friends. After all, Ted Takasaki, of Sioux Falls, S.D., has a reputation as one of North America’s best professional walleye anglers. His, and my secret is this: we are both closet catfish anglers. Ted grew up in the farmlands of central Illinois and only had access to fish the small lakes, creeks and rivers for whatever swims, including the whiskered varieties. 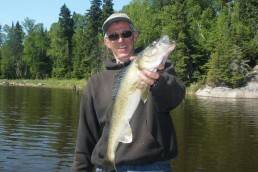 In addition, we have caught many tanker catfish while trolling for walleyes on the Great Lakes. Ted believes catfish are one of the most overlooked species around. Maybe it’s because a catfish may have a face only a mother could love. But you have to consider its attributes. A mature catfish can be huge. The North American-record flathead catfish caught on a rod and reel weighed 123 pounds when it was taken from the Elk City Reservoir in Kansas in 1998. The continent-record blue catfish weighed 111 pounds when it was taken from the Wheeler Reservoir in Alabama in 1996. No other record for common freshwater gamefish has even come close to these two. And for the channel catfish we all treasure, the North American record weighed in at 58 pounds Brutes like these all put up a great fight. 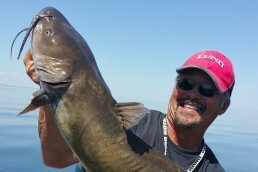 Another great attribute that catfish possess is that they will also bite readily when the weather is hot and the action for other species has slowed down. Several years ago, we reawakened a childhood love affair with cats on a trip to the Red River just north of Fargo. In just a few hours of furious action, we boated 20 cats over 12 pounds. It was fun—you plant your feet, set the hook and the rod just bends over double. The tackle for catfishing is simple. Start with a sturdy 7- to 7 1/2-foot rod and baitcast reel spooled with 20-, 50-, or even 70-pound-test monofilament or braided line. It must be able to withstand a wrestling match with a trophy catfish and has to avoid the nicks that could cause the line to break. Thread on a 1-ounce, egg-shaped inline sinker for spots with heavy cover or a bell-shaped sinker for less snaggy areas. The slip-sinker feature allows you to change the location of your bait by simply letting out more line and letting the current pull it downstream while the sinker stays put. Next, tie on a barrel swivel and attach a 2- to 3-foot leader of a strong line rated somewhat lighter than the main line. That way you can break free without losing the sinker if the bait/hook gets hung up. Add a 3/0 or 4/0 hook and you’re all set. Cut baits are best to use, and try shad, mooneyes or suckers. Check state laws to be sure your bait complies. Or you can just buy the prepared cheese or blood baits available in many tackle shops. Nightcrawlers, chicken livers or shrimp can also work. The best spots are typically river bends. The sharper ones are even better as they tend to collect more debris that fish use as cover. Also target the holes usually found on outside turns. Catfish may hold in the deeper portions of areas during the day and move to shallower locations in the low-light hours. Position the baits in places where water is “crashing” around the hole, creating areas of slack water. If you’re near heavy cover, don’t wait long to set the hook; try a count of 10. If you wind up where the fish has wrapped itself around the timber, shorten the count even more next time. These fish have an uncanny ability to wrap your line around a log. Crop an anchor or just simply push a button to drop your Talon (shallow-water anchor system). Cast the bait downstream into water just 2 to 4 feet deep on flats adjacent to the channel during low light. Set the depth so the bait floats with the current while barely ticking the bottom at times. 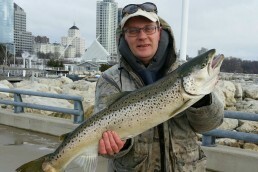 Practice catch and release with the big ones too. Many DNRs have been toying with changes that lower the daily possession limits in addition to slot size limits. The DNR for each state is concerned that anglers are taking limits of big flatheads and channels from places like the Mississippi and Minnesota rivers. The hope is that these new rules will help protect trophy fisheries. The kitties are calling—now is the time to answer the call. Ted Takasaki is an International Fishing Hall of Fame professional angler who has been featured in many national outdoor magazines and television shows. Takasaki has appeared in front of thousands of angling enthusiasts and is considered one of America’s top walleye and multispecies anglers. Follow him on his Facebook page.